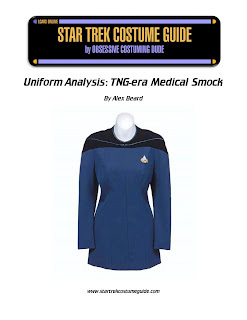 Star Trek Costume Guide: TNG medical smock analysis added! Costume designer William Ware Theiss established a unique visual aesthetic for The Next Generation’s uniform family throughout its first season, “setting the tone” for the remainder of the show. And now, having covered the TNG jumpsuits, TNG skants, and TNG season 1 admiral uniforms, we can move forward into the show’s second season. The Next Generation’s second season introduced some new faces, including Guinan, Chief O’Brien (as a regular supporting character – obviously Colm Meaney made a couple brief, albeit anonymous, appearances the previous year) and Dr. Pulaski, whose costumes we’ll be examining in this installment. Season two also incorporated some new talent behind-the-scenes; Theiss did not return for The Next Generation’s second season, and the role of costume designer was filled by Durinda Rice Wood. Despite her numerous accomplishments that year (wardrobe updates including, but not limited to Worf’s baldric, Wesley’s “acting ensign” uniform, and Counselor Troi’s costume, as well establishing the “looks” for Guinan and the Borg), Wood’s gone on record numerous times saying she wishes she’d been able to change the actual Starfleet uniforms in the show. She seems to have achieved other minor victories with the new two new uniforms she introduced that season, including Dr. Pulaski’s medical smock (which we’ll be examining in this analysis), and her season 2 admiral uniform (which we’ll be looking at soon). In this new costume analysis, we examine the uniforms which were exclusively worn by the character of Dr. Pulaski. Did you know that she wore not one, but seven different versions of the uniform over the course of the season? Or that the uniform color wasn’t really blue – that it was actually teal, but usually registered as blue on-camera? Read all about Dr. Pulaski’s uniforms here, or simply click the “TNG” tab above and select the new “TNG medical smock” option! I have loads more goodies for you over the coming weeks, so check back often and subscribe to my "Costume Guide" e-mail newsletter (upper right) for updates!